In just a few days, ANSYS will unveil the most feature-rich release in our 45-year history. Because we’re so excited about ANSYS 17, we want to share the latest news about the release as soon as it’s available. To make sure you are in the know, be sure to sign up for the ANSYS 17.0 mailing list, using the short form on the right. 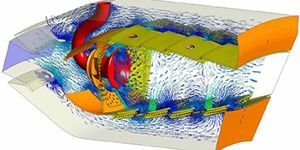 That way, you’ll learning how to advance your product development process by an order of magnitude by leveraging the leading engineering simulation software on the planet.